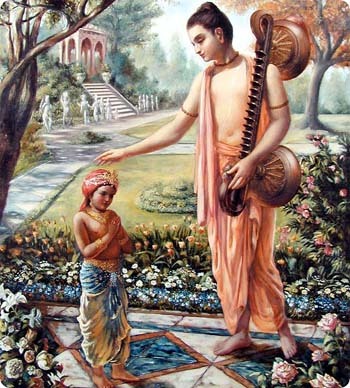 During the Satya Yuga, Sage Kashyap and one of his wife Diti had two sons – Hiranyaksha and Hiranyakasipu. Hiranyaksha troubled the humans and the Devas alike. 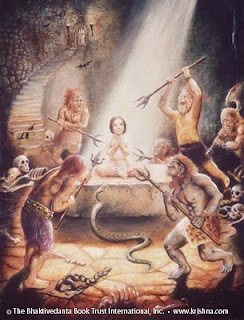 The humans and the Devas unable to take it any more prayed to Lord Vishnu to protect them. Lord Vishnu being the Preserver incarnated as a Boar to protect the humans and the Devas. This avatar is called as Varaha Avatar. After the death of Hiranyaksha,Hiranyakasipu furious with the humans and the Devas, lead his army of asuras to attack them. However the Devas fought Hiranyakasipu and his men. Hiranyakasipu came to know that every time, Lord Vishnu helped the Devas to fight him back. Hiranyakasipu started his meditation and soon forgot all about himself and his kingdom.Meanwhile Lord Indra the King of the Devas came to know that Hiranyakasipu was not leading his men. Realising that if he acted now, he would be able to destroy the Asuras such that they would never be able to attack him again…Now is the right opportunity for me to strike at the heart of the Asuras. Without Hiranyakasipu, their strength is halved…Now if I destroy the Asuras, even if Hiranyakasipu comes back, he would not have an army to follow his orders… Thinking so, Indra along with other Devas attacked the kingdom of the Asuras. Just as Lord Indra had expected, without Hiranyakasipu, the Asuras were no match for him. The Asuras lost the war. Lord Indra drove away most of the Asuras. 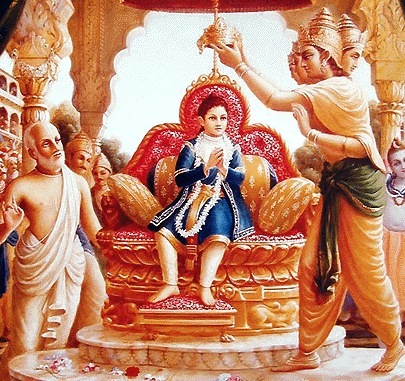 After destroying Hiranyakasipu’s capital, Lord Indra marched into Hiranyakasipu’s palace. Sage Narada if possible looked even more angrily at Indra, ‘Fool! 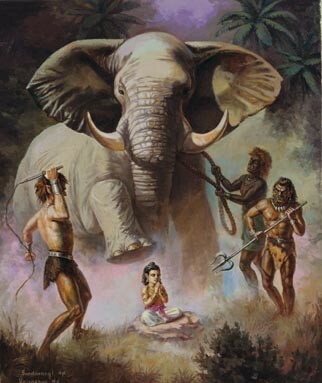 Just to win your battle, you will hurt another man’s wife, who has done no harm to you…’ Narada pointed a trembling finger at Kayadu, ‘She is pure and innocent…Taking her prisoner would be a great sin…’ Indra looked at the angry sage and realised that he had no choice other than to let Kayadu go. Indra nodded at his men an they vanished from there leaving Kayadu in the middle of the ruined capital. 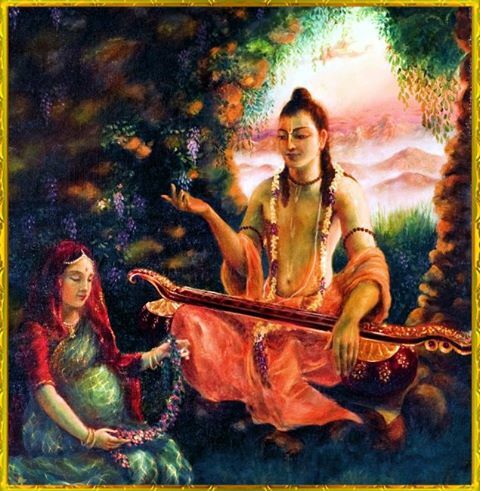 Sage Narada helped the trembling Kayadu, ‘My daughter! Are you all right?..’ Kayadu looked shaken for a few minutes. She closed her eyes and took deep breaths trying to calm herself. Finally she opened her eyes and looked at the sage. She bowed at him,‘Thank you sir! 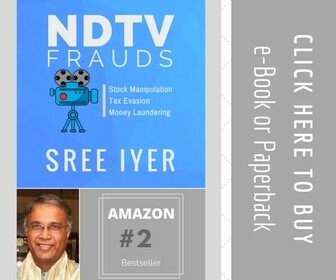 Thank you for saving my life…I may be Hiranyakasipu’s wife sir, but he is the only man I have ever loved…If Indra had taken me, I would have killed him and myself…’ She said angrily gritting her teeth, clenching her hands into a fist, shaking slightly. Lord Brahma and the other Devas were meanwhile having a very big problem. 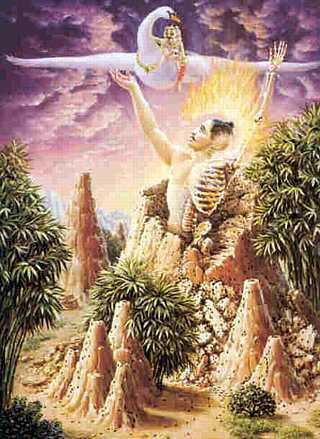 The air of the heavens were becoming hotter and hotter and the Devas were finding it difficult to breathe. Wondering what had happened, the Devas searched that found that Hiranyakasipu’s penance was becoming so powerful that the air of the heavens was burning up. Unable to take it anymore, the Devas ran to Lord Brahma. When Lord Brahma heard this he stayed still for some time. He knew that granting this boon was not good considering that Hiranyakasipu had shown utter contempt for all other lives. But he also knew that he had no choice. He had to grant whatever was asked of him. Hiranyaksipu’s penance had been very powerful. Narayana…I think you will need to take care of this… He thought as he said, ‘So be it Hiranyakasipu! Your wish has been granted.’ Saying thus Lord Brahma vanished from there. Hiranyakasipu overjoyed with the boon ran back to his kingdom.He was hurt to see that most of them were destroyed by the attack of Indra. I will wreck revenge on Indra for this. Armed with the boon, Hiranyakasipu attacked Indra. Indra had no chance. The Devas were driven out of Devaloka. Hiranyakasipu became the ruler of the Heavens. Hiranyakasipu found Kayadu and brought back his wife home. Hiranyakasipu stopped stunned for a few seconds. He got angry, but with great difficulty curbed his anger. He nodded his head and sent for the boy’s teacher. He asked Prahlad to go and play with friends as he wanted to talk to the teacher alone. When the teacher appeared, Hiranyakasipu was furious. The Guru quailed with fear. He stammered, ‘L..Lord…Lord…I did not teach him these things…’ Hiranyakasipu shook his head furiously, ‘Watch over the child! Someone is teaching him these useless things…’ The guru nodded his head and quickly went away from there, least Hiranykasipu get more angry. At the school, the Guru taught Prahlad about how Hiranyakasipu was the Lord of the three worlds and how he was to be worshipped…However Prahlad was distracted when he heard this. He shook his head, ‘No sir! This is not right! 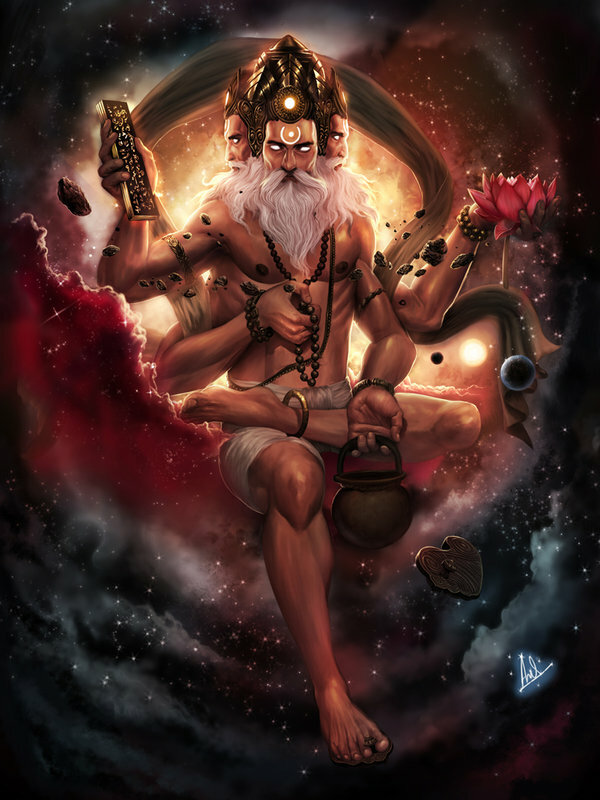 Lord Vishnu is the Lord of the three worlds. The whole universe exists because of him…’ The guru became furious and afraid at the same time. Furious that Prahlad was defying him openly in the class for all the students to hear and afraid that if Prahlad repeated this to his father, Hiranyakasipu may become furious with him. The men fell over backwards and pulled Prahlad with them. They took out their swords. The first guard struck Prahlad and watched surprised as the blade fell from the hilt…Prahlad looked unharmed and without fear. All the guard together struck Prahlad only to find their blades breaking off even before it struck Prahlad. Bewildered they turned to Hiranyakasipu. Enraged Hiranyakasipu then ordered Prahlad to be bitten by poisonous snakes. 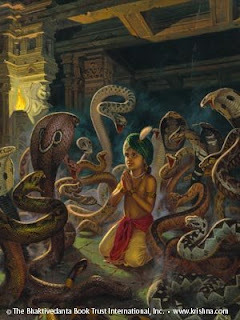 However the bites of the snake did not affect Prahlad at all. Prahlad then sat under a tree deep in meditation to the Dark Lord. Furious Hiranyakasipu turned on mad elephants at Prahlad to trample him. Hiranyakasipu was stunned when he saw the mad elephants sitting peacefully before Prahlad looking at him. Hiranyakasipu called his sister Holika. ‘Sister Holika! I need your help!’ Holika bowed to Hiranyakasipu, ‘Speak my Lord!’Hiranyakasipu said harshly, ‘You have received a boon from the Lord that fire cannot harm you! I want you to use that boon now.’ Holika frowned looking at Hiranyakasipu for explanations. 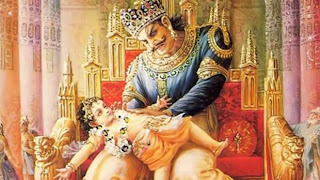 ‘My son Prahlad!’ Hiranyakasipu spat out, ‘He..defies me openly…I don’t want to see his face again…I want to kill him..He is no son of mine…I want you to take Prahlad in your lap and hold him tight, so that when I set both of you on fire, he would….’Hiranyakasipu said venomously. However Hiranyakasipu had not calculated the power of devotion. Prahlad gave no sign of even knowing what was going on around him. However Holika, the one who was immune from fire started burning. Now Hiranyakasipu felt afraid. He went to Prahlad and pulled the boy up. The boy woke up as if from a trance, looking around him. Hiranyakasipu shook him, ‘YOU SAY YOUR VISHNU IS EVERY WHERE? He yelled, ‘Where is your Vishnu now? Is he here, behind this tree, Is he here in this setting son, Is he inside my palace? IS HE IN THIS PILLAR?’ Hiranyakasipu yelled loudly. Hiranyakasipu stopped stunned as he saw the pillar shatter and from the pillar emerged a ferocious…What is that? It has the face of a lion and the body of the man…Hiranyakasipu hastily stepped back, looking at the half man-half lion. 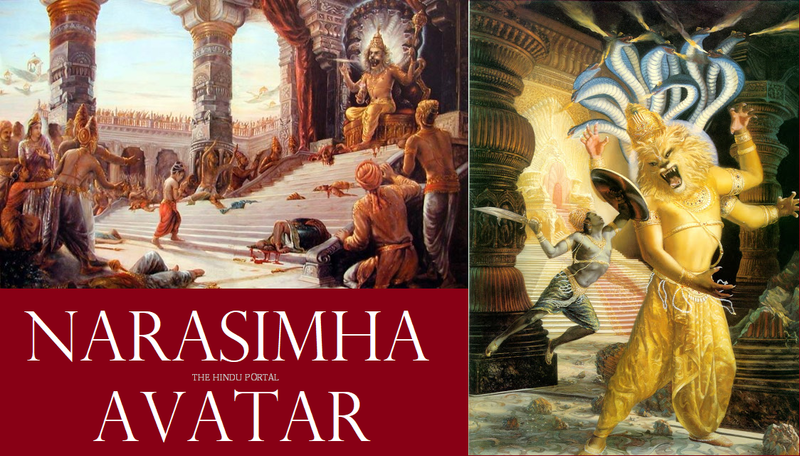 He shook his head unable to believe himself, when the half-man half-lion bellowed loudly, ‘I am Narasimha, the avatar of Narayana, and I have come here to kill you…’ Narasimha advanced with glowing eyes. 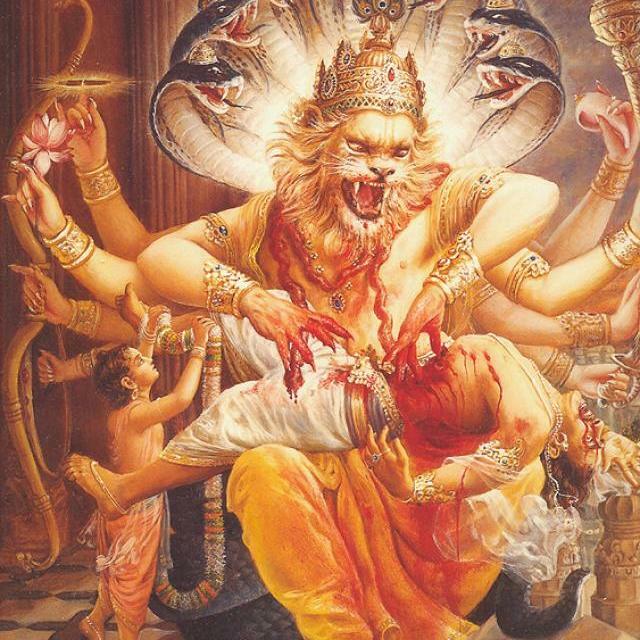 Before Hiranyakasipu could escape, Narasimha caught him with his clawed fingers, in a vice like grip. Hiranyakasipu struggled against grip, but it was of no use. Narasimha took Hiranyakasipu and dragged him to the threshold of the door [neither inside nor outside the house] and placed him on his lap [neither sky nor the earth] and there killed Hiranyakasipu with his claws [without weapons], at twilight [neither day nor night].After killing Hiranyakasipu, Narasimha let out a loud roar and sat on Hiranyakasipu’s throne. 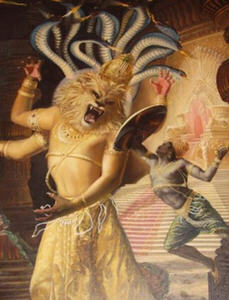 Looking at the face of Prahlad, Narasimha smiled, ‘Yes son! 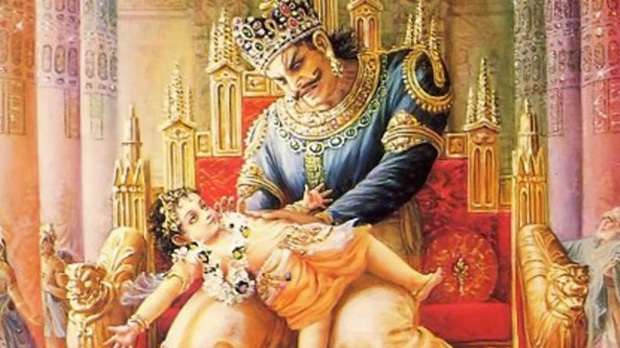 For you I have come!…’ Prahlad looked at his father’s body and looked at Narasimha, ‘Do not worry son! You do not know his story! once more. Prahlad became the benevolent ruler of the Asuras, who prospered during his reign and gave up there old cruel ways.